Once upon a time there was a family of happy Biscuit Bears. They loved each other very much, and they spent every day playing in the grass and traveling across the mountains together. Sometimes the Bears saw other animals, like birds, and fish, and wolves and deer. All the animals were friendly and played with the little cub Biscuit bears. 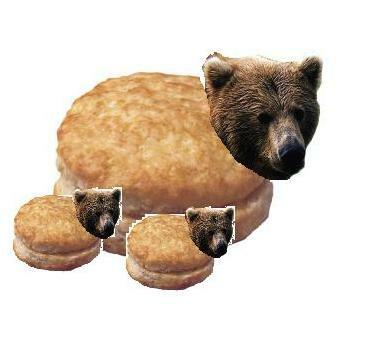 But sometimes the Biscuit Bears saw people. And when people come they kill the birds, and fish, and wolves and deer. 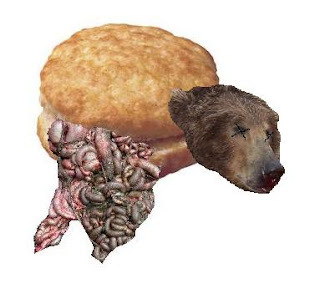 Sometimes the people kill the Biscuit Bears, too. The Biscuit Bears can be made into delicious Biscuit Breakfast, so the people like to kill them most of all. 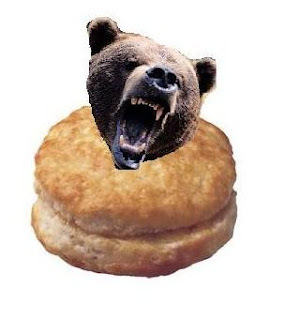 But the mommy Biscuit Bear is big and can be very scary to the people. She can be mean and will try to scare the people away. When she stands up and makes big noises it makes the people run. But some of the people don't run. Some of them have shouting sticks that hurt the Biscuit Bears. And they can hurt the mommy Biscuit Bear until she stops being angry and goes to sleep. The people use pointy fingers to take tubes out of the mommy Biscuit Bear, but she doesn't even wake up. The cub Biscuit Bears know to stay hiding. They can go smell the mommy Biscuit Bear when the people leave. 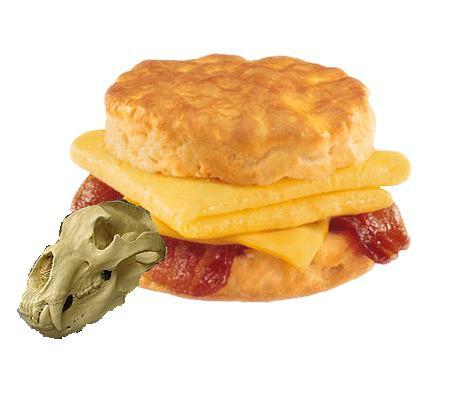 The people put yummy eggs and cheese and bacon in the mommy Biscuit Bear. Even the cub Biscuit Bears think the smell is tasty. There is not much left that looks like the mommy Biscuit Bear. The people took most away, but left the tubes. The cub Biscuit Bears decide that the tubes don't really smell like the mommy Biscuit Bear, and will to wait for her to come back. Maybe she will bring the tasty smell with her. Goddamn it. Now I'm hungry.